A good mystery should keep you guessing until the very end. It should deliver a solution that defies your earlier instincts and speculation, while also making complete sense. Murdered: Soul Suspect does keep you guessing until the end, but for the wrong reason. You'll wonder if and when Soul Suspect will transcend issues like inconsistent clue-discover, tacked-on combat, or a general lack of polish, to just let the interesting core mystery really shine. Well, I've got a spoiler for you: it never really does. Soul Suspect's fate is a sad tragedy because it tells a somewhat engaging story with a few likeable characters. Fedora permanently fixed to his head, protagonist Ronan O’Connor is an interesting lead--and the fact that he dies 30 seconds into the game helps jumpstart the intrigue. A reformed criminal-turned-cop still facing plenty of strife, Ronan is unable to move on from his ghostly state and reunite with his deceased wife until he finds out who killed him (and numerous other citizens of Salem). With ghostly powers that let him speak with fellow spooks, inhabit the living to read their thoughts, and look back in time when encountering spirit-infused items, it’s an interesting-enough premise. Sadly, the fact that he’s unable to communicate with common folk makes for some lonely stretches of story. Fortunately for Ronan (and the player) the introduction of a sidekick early on adds a bit of heart. The duo is thrust together out of necessity, and they help each other when convenient, but each ultimately has their own best interests at heart. It's the beginning of what could be a friendship, but the adverse circumstances aren't very conducive to it. It's not a budding romance, a faux-parental relationship, or a fast friendship. It deserves some commendation as it is what will drive you to solve Soul Suspect's underlying mystery. Before starting Murdered: Soul Suspect's final encounter, you'll be warned that you'll no longer be able to search through the city of Salem. Take heed of that note; once you commence the final chapter (which is criminally short), you'll lock that out, with only the minutes-long conclusion playable at that point. If you can transfer your data to a new device at that point, it's highly recommended that you do that. Investigating crime scenes and other areas of interest makes up the majority of Soul Suspect's gameplay, but it suffers from some prominent flaws that will stifle your investigations. For one thing, finding clues is often akin to finding a needle in a haystack; some won't pop up until others are discovered, leading you to comb a particular area dozens of times. This might make sense if the first clues you found were critical to the next batch, but more often than not it's just the game's unwillingness to show them all at once. The unfortunate side effect is that you'll overlook what should be an obvious location of a later clue and waste time scouring the entire environment because it wasn't marked from the start. The bigger issue at play here is the fact that the crime-solving isn't very interesting, since there’s not much to actually solve. You don't need to find every clue to progress (only enough to guess the solution). What's worse, when you're asked to decipher clues to determine Ronan's next move via a deduction minigame, you can make as many wrong guesses as you want. An on-screen indicator suggests you have a limited number of guesses, but it never drops to zero, and there's no benefit or punishment tied to your performance. The only thing with a hint of consequence is the line of questioning Ronan delivers to various witnesses; a good portion of the conversations you'll have will arbitrarily end before you have the chance to ask every possible question, though it doesn't seem as though the game plays out any differently based on what you're able to ask. Soul Suspect does include some semblance of combat and stealth segments, but both feel tacked-on. Some of the buildings Ronan explores are patrolled by demons that have the ability to banish him to hell should he be discovered and attacked. However, find a nearby designated hiding spot to teleport into, and you'll avoid the fatal gaze. If you sneak up on a demon, a quick button prompt will execute it--unfortunately, these interactions are annoying filler. They never get any easier or harder to complete, and because there's no nuance to combat, they're never very rewarding. Can you sense the guilt on the painstakingly motion-captured faces of potential perps? If so, you might have what it takes to crack LA Noire, Team Bondi's old-timey crimey caper. Much like in Murdered: Soul Suspect, you die at the beginning of this game, but you have far more interactivity with items (and a cute doggie). Plus Ghost Trick has amazing animation! Time will tell whether The Wolf Among Us wraps up nicely, but you can't debate how cool it is that crime scenes will change depending on the order that you decide to visit them. How far will Ethan Mars (and his allies) go to save his son's life? Your choices in Heavy Rain determine whether the child will be found, and who will be left standing in the wake of the Origami Killer. Who is Serial Killer X? What will Ethan Thomas find with his forensic tools? Why are so many Ethans investigating murders? How many rebar strikes will kill a scary hobo? Find out in Condemned: Criminal Origins. Discover the identity of the Raincoat Killer, the meaning of “FK in the Coffee,” and how a game can be so bad that it's good. Yep, that's Deadly Premonition in a nutshell. Even if you're fine with Soul Suspect's mediocre gameplay, you'll tear your hair out once you get lost for the 20th time. When you're in an interesting area like a museum or a police station, it's easy to remember where to enter, exit, and find noteworthy items. When an environment lacks personality and every area looks alike (such as a drab old mansion or Salem's repetitive streets), the lack of clear boundaries is a curse. Because Ronan can walk through most walls, Soul Suspect is often in want of a directional tool, but there isn't even an in-game map. Be prepared to check online solutions regularly. Despite gameplay shortcomings, Soul Suspect is very attractive on the PS4 and Xbox One. Ronan, his sidekick, some of his more frequent spirit companions, and a few of his cop co-workers have a nice level of detail; they're expressive and well-animated. Similarly, some of the ghostly visual effects are otherworldly. You'll continually be impressed by Ronan's spectral outline remaining in place on every single wall you walked through. As great as those elements are, though, they present some equally alarming issues. Unimportant NPCs have low-detail design. Far less attention is given to lip-syncing (they'll often perform gestures unrelated to their dialogue) and there's a rampant frequency of character model and dialogue recycling. Add to that numerous incidents where an NPC's conversational voice fails to match the character model or internal dialogue, and you've got a confusing mess. It's tough to tell which is more off-putting: a young-looking NPC with an elderly voice, or the fact that a half-dozen people will have the same exact thoughts. At some point you'll just tune all NPCs out entirely. Far tougher to tune out are the bigger glitches that pop up, with two of note causing issues during my playthrough. After an hour, the “Current Objective” never changed in the pause menu. It remained the same throughout the rest of the game, forcing me to pay close attention anytime a new objective flashed on-screen, lest I search the environment without direction. Frequent audio cues were missing as well. I had one side-mission go unfulfilled because the NPC delivering the vital info didn't have any audio or subtitles accompanying the speech. It's really sad that Murdered: Soul Suspect fails to fulfil its promise. There are some interesting characters and plot-lines, as well as some really great visuals (depending on what or who you're looking at), but the game's strengths are haunted by mediocre gameplay and substandard production values. You won't feel any smarter having solved Soul Suspect's mystery, nor will you feel tested by its combat. Perhaps it's a blessing that most will quickly forget this game and get on with their lives. 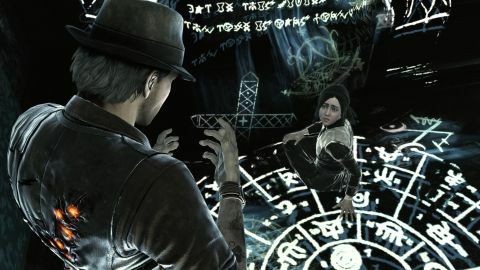 Description Murdered: Soul Suspect takes players into a whole new realm of mystery where the case is personal and the clues just out of reach.